Over twelve years ago, Steve and I were on a mission trip, one of many we embarked upon together. One evening my mom called: my best friend from grade school and middle school had passed away from a genetic heart condition after heart surgery. I spent the evening crying and milling around the school grounds where the staff and campers were housed. I felt angry, shaky, and mostly, brokenhearted. My friend and I had all but ended our friendship in middle school. She had found new and cooler friends. I was never the popular/cool girl. I didn't wear designer clothing, I wasn't athletic, and I was rule-follower. School to me was a place that tortured the socially uncomfortable. I had many happy memories with her before she drifted away. Hours spent in her swimming pool. Sneaking her mom's makeup (Mary Kay!) and painting our nails. Making nachos with Doritos. Her mom letting us watch Steel Magnolias---ironically about a young woman who dies too young of a disease. (To this day, it's one of my favorite movies.) We named all of our future children. One of my four daughters, and one of hers, would share the same name: Maybelline (yes, like the makeup). We called our mutual crush on her pink telephone, the one she kept all to herself in her room. Then we'd go to church on Wednesday nights just to flirt (in our fifth grade ways) with the mutual crush. I wondered why God would let my friend die. She has already lost several family members to the disease, including her own mother. Why could she not be the one who got a shot at life? One of the lucky ones? I recalled the time I was taking classes at the local community college, and I bumped into her. She was beautiful as always (she had the most fabulous hair!). We cordially said hi to one another, and then she bounded off down the hallway with another girl, one I deemed much prettier and no doubt cooler than me. (Junior high memories die hard.) I slumped to my next class feeling confused and disheartened. I felt remorseful for all the ways I didn't try to reconnect to her. The fact that I didn't attend her mother's funeral, located at a small Christian church just three miles from my house, because I felt it would just add salt to the wound. The ways I wasn't brave. Psalm 34:18: "The Lord is close to the brokenhearted and saves those who are crushed in spirit." There have been many times in my life when this verse has helped me through another season of hardship. When feelings of unworthiness, anxiousness, uncertainty, fear, confusion, and anger have made a home in my heart. As I type this post, I know some of you are in this place. I know there are HARD and BIG and CONFUSING things going on in your life, and you are trying, oh you are trying, to deal with them. I see so many questions being posted in adoption Facebook groups: questions about openness in adoption, questions about which agency to choose, questions about how to answer a child's questions about his or her adoption. These are tie-your-heart-in-knots questions. These are the things that keep us up at night, that weigh on our minds as we are supposed to be listening to a presentation at work or helping a child with his homework, that attempt to capture our joy and peace. Some of these things we deal with and move on. But some of them torture us, tempting us to make the wrong choice or telling us there is NO WAY we will be successful and hopeful. There are the days that your past heartaches are uprooted and thrown in your line of vision like New Year's confetti. Maybe it's the miscarriage or the baby you always wanted but never carried. Maybe it's the foster children with whom you fell in love with who went home. Maybe it's the reluctant partner who just isn't sure adoption is the right choice. Maybe it's the time you didn't say or do the right thing on your adoption journey. Maybe, like me, you've struggle with losing someone you loved. Someone you still love. Maybe you've had a traumatic experience where someone has taken advantage of you, where you were in an accident or part of something you wish would just disappear. The Lord is there. He's there in those murky, shaky memories. He's there in your moments of desperation and fear. He's there in your not-so-Jesusy-thoughts. He's there in your future, too. There are so many things that happen in life that are simply heartbreaking. Do you recall your moments? Don't they render us helpless and rage-filled and numb and apathetic and doubtful and jealous---all at the same time? Sugar, I don't have this whole heartbreaking thing figured out. I don't even like to THINK about those past heartbreaking moments. In fact, this post has been written and deleted many times over the past few years. I wasn't ready then to share with you about my friend. I'm not sure I'm really fully ready now. A few months ago, I found a few books my mom had given me from my childhood. My girls grabbed one of them, a large picture book from Disney's Snow White, and on the inside cover, there was, in fourth-grader handwriting, a "to" and a "from." The "to" was to me, the "from" was from her. I felt my chest tighten, and memories flooded back. I need you have Psalm 34:18, because I know, I KNOW, that someone today needs to read it. I need it today. When I was a little girl, my mom once planted some flowers in our front yard. They were very hard to grow, she told me. Hard to keep alive and healthy. But one day they bloomed, and they were spectacular: a vibrant fuchsia color, contrasting against the surrounding greenery of the moss and grass and the gray-brown bark of the big trees. 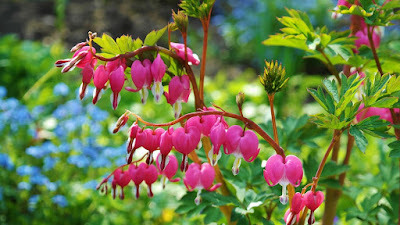 These flowers were Bleeding Hearts. Today, more than ever, I appreciate the effort my mom put in to growing those flowers. They are powerful reminder of the fact that we are never fully healed from our brokenheartedness. But that, Sugars, that brokenness in our heart, is exactly what makes us human, what makes us clumsily hopeful, and what makes is possible for there to be more room for beauty to grow.